Hoping someone can guide me here. I would like my eshop_free delivery plug-in to appear on the front-end as 'Collect from Store', rather than 'FREE SHIPPING'. I have changed the title in the eshop_free plug-in, but it doesn't seem to have any effect on front-end. I have also tried adding some words in Translation but not really sure if I'm doing this correctly. Doesn't work in any case. See attached screen-shot. Any help appreciated. Replied by Giang Dinh Truong on topic Free Shipping Plug-in Title? Replied by Kai M on topic Free Shipping Plug-in Title? 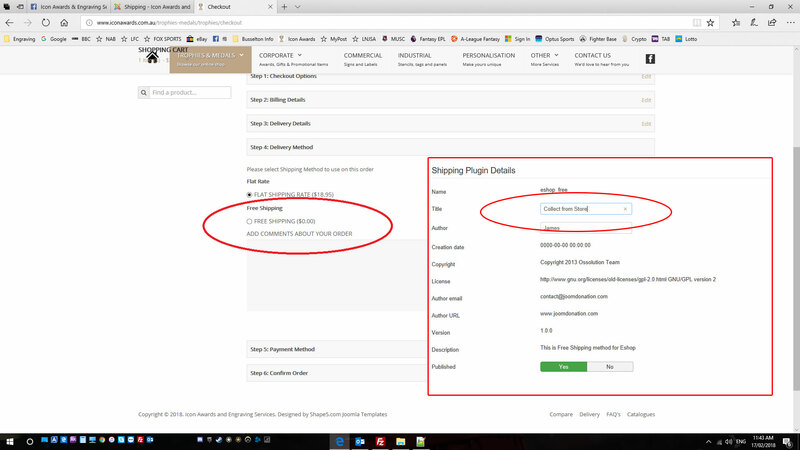 Is it possible to get this information somehow on admin message that admin knows which shipping method customer has chosen? Now message shows up only shipping method by Geo-country name. I think this requies a small changes to both of Weight Shipping plugin. Please submit a new ticket to EShop category to send me the super admin account to your site so I can help you.